Gutter cleaning often takes a backseat to more pressing home repairs. Unlike lawn cutting, this seasonal task is easily forgotten when other, more noticeable repairs take precedence. However, keeping rain gutters cleaned and repaired prevents many expensive, major home repairs from making your list. Prevent drywall damage, roof leaks or water damage to soffits and fascia with expert gutter cleaning by My Handyman OnDemand. A regularly scheduled gutter cleaning with one of our professional technicians extends the life of your roof and protects your home's value. High winds and heavy rain can often do more than just cause twigs and leaves to clog your rain gutters. Down spouts break or leak which makes it difficult for rain water, ice and snow to escape your roof, causing major water damage both inside and outside your home. Gutter installation, repair and cleaning services from My Handyman OnDemand help keep these drainage systems working properly. 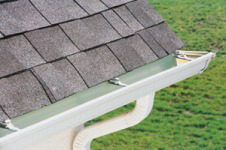 Next to a clog, leaks in joints or loose gutters are common issues that prevent rain and snow from properly draining. Our experienced team is equipped to handle every leak before serious damage makes rain gutter installation your only option. Soffit and fascia are elements that contribute to the beauty of a home. However, their role is not just cosmetic as they help to insulate the home and allow air to circulate properly. Weather, water damage, rotting leaves, birds, squirrels, bees and termites are the main culprits that damage the soffit, fascia and other roof components such as eaves and overhangs. Fixing damaged soffit and fascia involves removing the debris, cleaning the gutters and then repairing or replacing the damaged boards. To do this it may be necessary to remove the gutter first. If you have termites or bee problems, the services of a pest exterminator may also be required. Let My Handyman OnDemand handle all your gutter, soffit and fascia repairs and replacements so the job is done properly and quickly the first time.